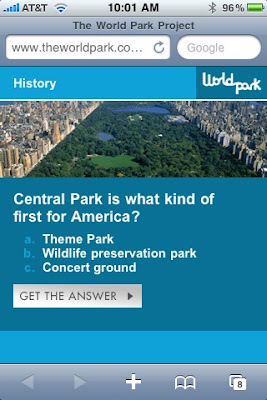 The World Park was an Arbor Day event that gave participants an interactive tour of New York's Central Park. QR codes (Parkodes) were placed along the path route, each one offering a chance to interact with a trivia question. The questions were broken up into categories and separated by color. The "Parkcodes" let users discover things about Central Park that they never knew. A map and scorecard were handed out before entry. History (blue) - Unlock history, scroll through viewsfrom the 1800's, and see how it has evolved over the past 140 years. Pop Culture (Pink) - Discover scenes from movies, tv shows and concerts that have been filmed or performed on along the park path. Science and Geology (Green) - Nerd out to a variety of facts, factors and facets that are sure to tickle your scientific curiosity. Unfortunately, a lot of the Parkodes we're stolen, broken, or damaged on Friday and Saturday, so we wanted to leak the great content we had. We will be gathering feedback from participants of The World Park over the next few days, hopefully you'll allow us to post the link here. Thanks for playing! The World Park team. Yes! Definitely update us with any news or feedback and post your links here. First Designer QR Code Makes TV History!! Best Buy Updates App with QR Code Reader!